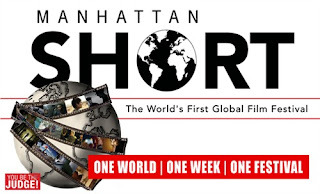 Strand Theatre - Vicksburg: MANHATTAN SHORT returns! The 10 MANHATTAN SHORT finalists hail from nine countries with films from Syria, Latvia and Georgia representing their respective countries for the first time in this event. Two short films hail from Spain, the only country with multiple Final 10 selections. These Final 10 short films represent the best short films among a record 1615 submissions from 75 countries received by MANHATTAN SHORT for 2017, testimony to the enduring vibrancy and creativity of short films. This year's Final 10 represent an extraordinary range of film genres with comedy, drama, horror, sci-fi, animation and martial arts short films all part of the MANHATTAN SHORT program. Do No Harm (New Zealand), Behind (Spain), Fickle Bickle (USA), Hope Dies Last (United Kingdom) The Perfect Day (Spain), Just Go! (Latvia), Mare Nostrum (Syria), Viola, Franca (Italy), In a Nutshell(Netherlands) 8 Minutes (Georgia). After the screening everyone at the Strand will vote for their favorite film and actor and our votes will be part of the worldwide balloting to decide the winners of this year's MANHATTAN SHORT! Martin's at Midtown where we can count the ballots and announce our winners while everyone has a drink or light supper. It was really a good post regarding the information about the Saturday night which just passed by, I had no clue about this lately but no I’ve. Thanks for that! I will definitely come check this place again with some other awesome friends of mine! It's one of best Los Angeles venues for having a good time with a joyous feeling. And it fascinates me with its great style and vibrant atmosphere.